48 HOURS VIP SALE, PRE-ORDER NOW! You know how much I detest seeing RBL polishes going for ridiculous prices on Ebay. And yet when murmurings that Scrangie and No More War were becoming hot commodities on the nail polish black market, I decided to reissue these two previously limited-edition polishes. For those of you who are scratching your heads in confusion (and I’ll admit, the names don’t exactly bring to mind a delicate pale pink or a ripe juicy tomato red…), Scrangie is a shimmering iridescent beetle wing in violet/blue/green, inspired by the nail blogger of the same name. 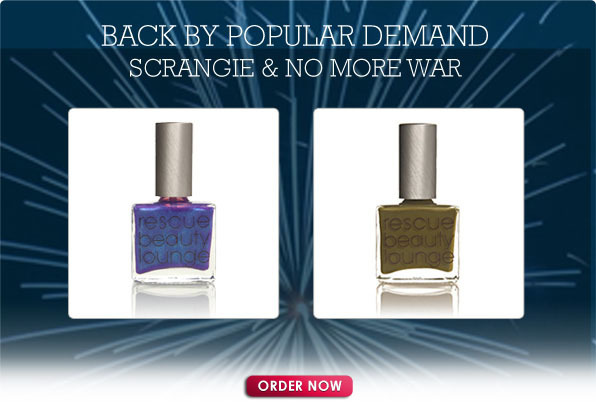 No More War is a pop-in-your-dirty-martini glossy olive green. Neither is your run-of-the-mill, off-the- drugstore-shelf shade. And given the demand for these colors, this next issue may only last as long as your weekend spray tan.